The main concern for businesses is – how to retain existing customers and attract new customers? If you are a small business, then you have to opt a cost effective way. A toll free number is an effective and affordable tool which help you to attract potential customers. Communication with customers & prospects is the key for any business to take the lead. this number encourage people to call you and ask their queries. Companies and businesses around the globe have utilized this number to business growth. 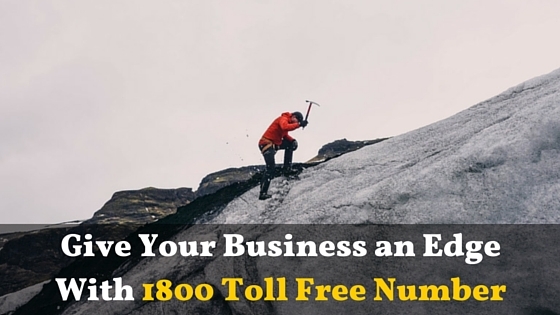 In this article, we’ll discuss how to give your business an edge with 1800 TollFree Number. Most businesses are still confused about the necessity of an 1800 number for their business. Here’s some benefits which show you how a tollfree number could improve your business growth and you can’t ignore these. Improve customer satisfaction by being available to take their call. It make it easy for your customers to reach you when they have any query. It shows that you care your customers. Providing a personal customer service makes a big difference & generates leads. It will make a professional image for a company thats why business owners prefer to get this number. A toll free phone number creates a credible image of your business. As we mentioned already in this post, toll free number is easy to use. So, customers are more likely to call you and it will increase your sales opportunities. Companies who have 1800 numbers are the ones who acquire larger order placements and more repeat customers. Many research studies have found that a toll free number can improve sales by 30%. Are you planning to relocate your company? Don’t worry, location doesn’t matter. 1800 toll free numbers can be moved to any location with your business. The number is yours for as long as you want it, even if you change phone service providers. It will help you to expand a business nationally and internationally. Make sure that you’re accessible to your national customers by providing them with a simple, cost-free way to contact you when they have any query about your service. A toll free phone number can allow your local business to advertise to a wider audience throughout the country and expand market reach. Global customers can easily connect to your company or business. Tollfree service is the cloud telephony service. It is on-demand service, you have to only pay for what resources you use. This model develops transparency for both customers and service providers. Vanity numbers are easy to remember and free for the caller, customers are more willing to call and inquire about business services and/or products. If you’re not using a 1800 toll free number or vanity number, you are missing a huge opportunity. 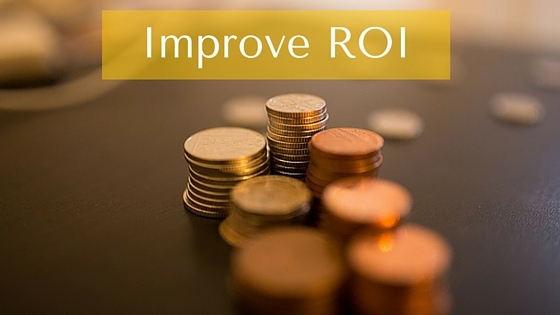 Are you trying to improve business ROI? Of course Yes! Every business is concerned about their ROI and business growth. Vanity numbers had a 75.4% higher recall rate than regular 1800 no. Startups and small business face many hurdles like customer acquisition, ROI, sales, low capital etc. Use 1800 vanity number for measuring results with specific marketing campaigns to find out how well each campaign is performing. Use one number to promote a “buy one/get one” promotion and another number to promote a “40% discount” offer. Now you can track where your leads are coming from. Call forwarding – This feature allow to forward inbound calls on a mobile or landline number instantly across the world. Caller ID – Caller Id feature will help you to identify a caller before answer the call. On hold music – Choose your favorite music like classical, rock, or electronic to keep the caller on the line. Call recording – This feature allows to record all the inbound call that you get. You can manage & delete these recorded calls anytime. Auto receptionist – Auto receptionist feature gives professional voice greeting to your callers. replaces the need for an human receptionist or operator. Your call volume of inbound calls will be increase. For manage these calls you need to set up an IVR to your toll free number. IVR (Interactive Voice Response) is a smart technology which help you to handle and manage the calls. It allows interaction between human and computer via telephone. It will help to get the customer reviews. IVR provides a menu, a caller may choose any option from menu for relevant information by pressing digits. For example, Press 1 for sales, Press 2 for support, and Press 3 for account. And calls are routed to relevant employee or department. It will save your time. A toll free number is a valuable and effective marketing tool. You opt a this for your business, but you’re not done yet. You have to make sure that you use and promote it in right way. Studies shows that, people respond 30% more to an advertisement with a toll free number. 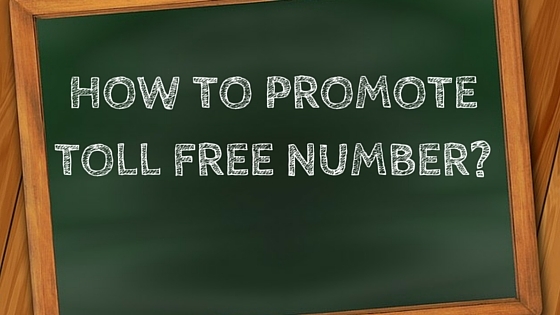 Here are some ways where you can promote your number. Mention your vanity number in your email marketing campaign. It will work as call-to-action and your number will be shown a huge number of potential customers. Consumers have a 57.6% Average Higher Recall Rate of Vanity 800 Numbers over URLs. Social media is a outstanding channel to find new customers and interact with your existing customers and target audience. Run the Facebook ads and use your vanity tollfree number as a call-to-action. Running a contest or promotion involving your vanity toll-free number is very effective when done through Facebook. It will help to build your brand and get you 1800 number in front of more potential customers. 4. Put your 1800 number on your attractive business cards. 5. Email signature with your number. 6. Use print media and direct mail and try to repeat the Toll Free number at least 3 times. Display the number for at least 20 seconds and repeat it verbally as well. Use you toll free number as a call to action for you business. Place you toll free number on your website and relevant web pages. It will get leads for you! 9. Most of smartphone users prefer click-to-call option to connect with a business. 10. Banners and flyers which carry a toll free number. If you have any queries about toll free number or cloud telephony, please feel free to share your views in comment box below! Vanity Toll-Free Numbers: Give your business an edge over your competitors, get a great easy to remember vanity number and stand out from the crowd! Search Engine Optimization (SEO): We can help by optimizing your website and getting you more traffic Website Building and Development: From small to large projects, our experts, can help design a frontend and backend and implement the latest code and technology to help your website look professional. Thank you for such a nice info. Toll-free gives my business a boost and allow customer call you free to generate more leads. Its also help in my brand identity. thank you.